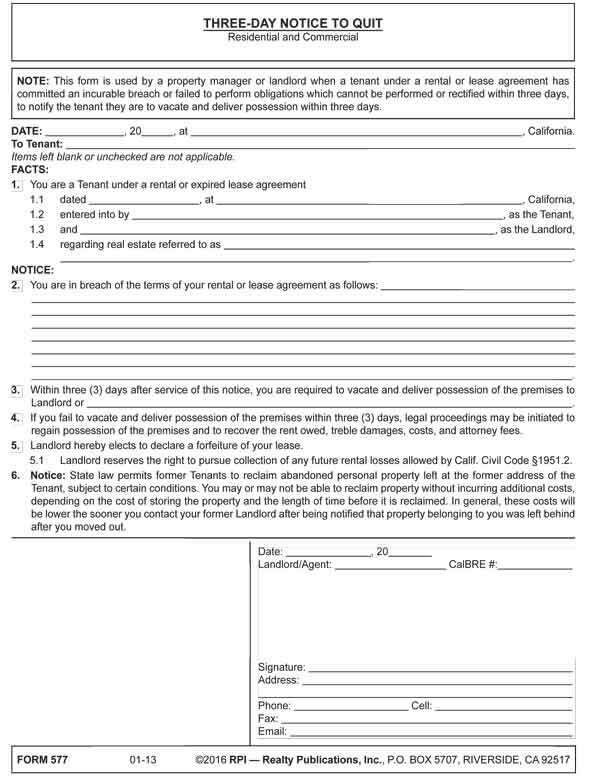 This form is used by a property manager or landlord when a tenant under a rental or lease agreement has committed an incurable breach or failed to perform obligations which cannot be performed or rectified within three days, to notify the tenant they are to vacate and deliver possession within three days. The type of three-day notice served on a tenant needs to be correct before an unlawful detainer (UD) or tenant holdover of a premises can be established and the tenant evicted. When a tenant’s breach is the failure to pay rent or other money obligation before it becomes delinquent, the tenant is served with a three-day notice to pay rent or quit. This type of breach is known as a monetary breach, curable by paying money. The three-day notice to quit does not need to state the provision breached or the activity of the tenant constituting the breach. Further, it does not need to include a lease forfeiture declaration by the landlord. Here, the tenant’s right of possession is automatically forfeited by the tenant’s incurable or statutory breach. Since these breaches cannot be cured by the tenant, the right of possession may only be reinstated if the landlord chooses to later waive the forfeiture. However, while a forfeiture of the lease has already occurred, a UD action requires service of a three-day notice before a landlord may recover possession. Both residential and commercial properties are subject to the same three-day notice and service rules. Personal delivery can be made wherever the tenant is located. Personal service is attempted at both the tenant’s residence and place of business, if known. These two attempts to personally serve the notice are a prerequisite to any attempt at substituted service. Statutory requirements need to be strictly followed when preparing and serving a three-day notice for the notice to be legally effective. When a UD action is filed to evict a holdover tenant, a completed proof of service will be produced at trial, as evidence the three-day notice was served. A notice to quit is distinguished in its use from a notice to vacate. A notice to quit is used when the tenant has materially breached a rental or lease agreement and the landlord uses the breach, if uncured or incurable, to terminate the lease by a declaration of forfeiture in the notice or an automatic statutory forfeiture forcing the tenant to vacate or be evicted in a UD action. A periodic tenancy automatically continues for successive equivalent periods of time, such as a week or a month. The length of each successive period of time is determined by the interval between scheduled rental payments. A periodic tenancy is automatically renewed when the landlord accepts rent. weekly rental payments, indicating a week-to-week tenancy. A periodic tenancy also arises due to occupancy under a defective lease agreement. A tenant who enters into possession under an unenforceable lease agreement (e.g., oral, or unsigned) and pays rent in monthly intervals that the landlord accepts is a month-to-month tenant. A landlord may concurrently serve both a three-day notice to pay (perform) or quit and a 30-day notice to vacate or change terms. However, the notices need to be served separately. If attached or otherwise combined, other than their being served at the same time, they may be reasonably confused by the tenant as one. If challenged, the confusion might defeat any UD action based on the three-day notice. Form updated 11-2016 to include the Form Description at the top, white header/footer convention and RPI branding. Form navigation page published 11-2016.